We are pleased to announce that on the 20th February 2019 we welcomed the arrival of Vlad Serban Nicusor, the newest addition to our unconventional and extended family of care here at the Saint Andrew’s Centre. Vlad was born ten years ago, on November 18, 2009 and sadly, he was diagnosed with chronic infantile encephalopathy sequelae (brain injury related problems). He comes from a single-parent family and has other two siblings. He remained close to his family for the first four years of his life until his condition got increasingly worse and he required specialized medical care and monitoring due to his diagnosis and associated medical problems. 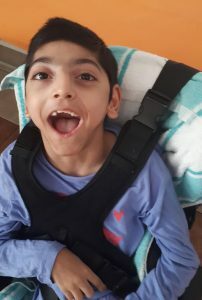 Although Vlad is not in the best shape from a medical point of view, he is a very happy child and engaged whenever people talk or sing to him. If you would like to learn more about Vlad, please call 0141 559 5690 and speak to Julian.